Hi Nikita, Welcome to the forum! Some people with celiac disease also have DH (dermatitis herpetiformis). Not all have it, but some. Some people do seem to be born with celiac disease or get it very early, but many more develop celiac later in life. Celiac disease is not really an allergy, but is an auto-immune condition. Allergies involve IgE reactions, while celiac disease involves IgA and IgG reactions. Welcome to the forum fubu! Your story of poor diagnosis is unfortunately not unusual. Most people with celiac disease are still undiagnosed today. Partly because many doctors don't think to check for celiac. Celiac and the gluten-free diet is more accepted in the non-traditional medicine field. But it would have been better for your ND to have you tested for celiac before going on the gluten-free diet. Now that you are gluten-free the celiac testing will not be accurate since your immune system response to gluten is declining. The important things is you are feeling better. Many of the forum members have not got a formal celiac diagnosis for similar reasons. Even some main stream traditional doctors will suggest people try the gluten-free diet without testing them first. Ignorance about celiac disease is in abundance in the medical field. I agree with eliminating oats. I get sick from oats and that has not changed in over 10 years. So it is possible she will always have a reaction to oats. I also agree with trying to keep her on a mostly whole foods diet. It is a good thing for her to learn to eat whole foods vs processed foods as they should be her main diet for the rest of her life. That being the "rule" there are always exceptions for kids. I suggest Aldi's gluten free wraps or Mission brand corn tortillas. Stay away from gluten-free bread for a few months. Some people react to the zanthan gum they use in a lot of it. If she is still on dairy try taking off it for a few months. I can eat Sour Patch Kids and Planters mixed nuts. Oh, and Lara Bars are good too. Those are probably ok for a treat. That's good they ruled out the T-2 diabetes and plantar fascitis Chris. That's 2 less things to worry about! Celiac disease can affect the nerves directly. Some people's bodies will attack the nerve cells instead of or in addition to the gut. In some cases, the nerve attack is on cells in the brain and is called gluten ataxia. Gluten ataxia can cause problems walking and balancing. An elimination diet is a good way to discover problematic foods. There are few legitimate medical tests for food intolerances but our bodies can let us know about problem foods. Hi Chris, Have you looked into diabetic nerve pain and also plantar fascitis? Both of those conditions can cause foot pain. The diabetic nueropathy would react to carby foods like rice and sugar though. B-12 is often suggested for nerve problems, but other B vitamins can help too. Hi, If you have DH, you have celiac disease. 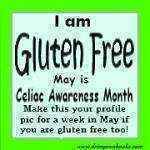 Only people with celiac disease get DH. So it might be better to go for a DH diagnosis since that testing is less invasive than the endoscopy / gastrocopy. The gluten challenge for DH is 12 weeks of eating a small amount of gluten. But the test is to take a small skin biopsy from next to a lesion, vs an endosocpy / gastroscopy. Hi, Welcome to the forum! Celiac disease affects the small intestine, not the large intestine. So pain from the large intestine could be a symptom of something else. That something else could be an additional condition that you have on top of celiac disease though. So, yes, getting all your test results is important. It could be you are making too much acid and or the acid in your gut isn't being neutralised. The acid in your stomach is neutralized by bile created in the liver and released by the gallbladder into the gut. People with celiac seem to have gallbladder problems fairly often. So that might be a good thing to ask about having checked. They do a test called a HIDA scan to verify the gallbladder is functioning correctly. Sometimes doctors will remove the gallbladder but that's not a great thing to do. If the gallbladder is not too damaged it is better to remove the irritant (probably gluten) and let the gallbladder heal itself. That isn't always feasible but sometimes is. Your GI doctor can best advise you. Hi ebutton, You could be experiencing reactions to other foods besides gluten. An elimination diet is a good way to identify food culprits. Nightshades are potentially a cause of joint pain. Oats are a problem for some celiacs There are many other possible foods we can develop reactions too. You may need to put your detective cap on! Hi Sabine, I live with gluten eaters and and do fine being gluten-free. I mostly eat at home and prepare my own food. I keep silverware and pots and pans of my own separate. I also have a mini refrig that I keep my food in. I rinse dishes before using them. I seldom eat out but when I do I go to places like Texas Roadhouse or Ruby Tuesday. But we are talking maybe a few times a year. I eat mostly meats, veggies, fruits, eggs and nuts. I do eat some gluten-free bread but mostly eat Aldi gluten-free wraps. If I eat cereal it is mostly chocolate Chex. I eat it dry. I also avoid the other foods that cause me problems like oats, nightshades, dairy, soy, grapes, carrots, celery, strawberries, caffeine, etc. I use stevia in tea instead of sugar. It seems to me that people often have GI symptoms for a year or two after going gluten-free. I keep Pepto Bismol and peppermint Altoids around. I have some DPV4 also. Welcome to the forum Joanne, I am sorry I can't help with the skin products question. Being a man I don't use such things myself. But I know they have been discussed on the forum many times before so maybe a helpful person will come along soon with info. Basic info regarding starting the gluten-free diet for you though: Try to stick to whole foods cooked at home for several months at least. No eating out at friends or restaurants. You may find it helpful to stop all dairy for a few months also. Oats are a problem for some of us as well as wheat, rye and barley So it might be good to avoid oats also. Your rash could be DH (dermatitis herpetiformis), which is a an itchy skin rash only people with celiac get. Sometimes people starting the gluten-free diet think they will recover in a couple weeks. But it is more common for recovery to take months or years. It would be wise to have your doctor check your vitamin and mineral levels for deficiencies. Hi TDZ, My understanding is the same, a full gluten challenge is needed for the DH diagnosis. The method the use for DH is to take a skin biopsy from next to a lesion, not on it. They check the biopsy for IgA antibodies. I don't know of any way to shortcut the process and avoid eating gluten to get tested. There may be a test some day that doesn't require it, but for now I don't think there are any out there. One thing he might not have tried is avoiding iodine. Some of the members with DH find iodine makes the rashes worse / longer lasting. He'd need to look up iodine containing foods and avoid them. I suggest talking to the doctor and asking for a dapsone RX. He may as well try it since it might help Dapsone is a temporary treatment though and not a long term solution. Welcome to the forum! Hi, Celery is one of the top allergens, so it could be a reaction to celery. https://www.livestrong.com/article/207641-celery-allergy-symptoms/ By the way, I merged your two similar threads. The forum rules don't allow duplicate threads, They make things confusing. But no problem, carry on! Hi Johna, Great, now that we have talked you out of eating all that food you can send it to me! Just kidding! Johna, rinsing the nuts and drying them should really help if they are contaminated. But it would be better to check with the nut company and see what they say about gluten contamination. Then buy nuts that are safe. How about eating beef, pork, chicken, fish, eggs, sweet potatoes (yams), beans, peas, cauliflour, cabbage, grapes, chickpeas, amaranth, quinoa, broccoli, etc, etc, etc. All these and more are naturally gluten-free foods. Here in the USA there is a chain called Aldi's that sells gluten-free wraps/tortillas. I don't know if they have the same wraps in the UK stores. But they do carry a number of gluten-free foods there. https://www.aldi.co.uk/special-diets/gluten?text=gluten free Here is a thread on microwave buns you can make. This article on Healthline is where I read about calcium interfering with iron absorption. It also says citric acid helps promote iron absorption. So eating a cheeseburger doesn't help your iron level nearly as much as eating a hamburger with a squirt of lemon juice. https://www.healthline.com/nutrition/iron-deficiency-signs-symptoms#section11 It can take months to recover iron levels even with supplementation. We just don't absorb it well. Plus with celiac damage to the small intestine we don't absorb foods well regardless. People can have GI symptoms from taking large doses of iron supplements. So it is probably better to take more moderate amounts daily than a larger dose once a week. The same goes for vitamin D. Vitamin D is better absorbed in a moderate daily dose than in a large weekly dose. This link lists some iron rich foods. I don't agree with eating tofu though as soy is a risky food and not great for intestinal health. So take that one out of their list IMHO. https://www.healthline.com/nutrition/11-healthy-iron-rich-foods You can take psyllium husk capsules for extra fiber. Psyllium husks are available at lots of health stores/pharmacies. Here's one source, there are many others. https://www.swansonvitamins.com/swanson-premium-psyllium-husks-610-mg-300-caps?otherSize=SW802 Many gluten-free processed foods are not fortified with extra vitamins and preservatives like their gluten counterparts are. So you are not getting your vitamin pill in a slice of bread or bowl of cereal now. Instead of vitamins many gluten-free processed foods are loaded with extra carbs and sugar. So not a great trade really except that the gluten is gone. Hi Johna, I think its pretty usual to have GI symptoms after first starting the gluten-free diet. One of the possible issues is bacterial overgrowth. When your intestines begin to heal, the surface area of the villi increases and that provides more real estate for bacteria to colonize. So things may get out of whack from that change. It can take time for the bacterial balance to re-normalize. One thing that may help is avoiding all sugar and carby foods for a few months. Bacteria thrive on those sugars and carbs and an overgrowth can cause symptoms. There is also the possibility of dairy reactions due to villi damage. Another tricky thing is oats. Oats are often cross-contaminated. Also some of us have an immune reaction to oats like we do to wheat, rye and barley. So removing dairy, oats, sugar and carby foods may help.